Cuong attacks a passenger on a bus on November 3, 2016 in this screenshot taken from a video filmed by Tuoi Tre (Youth) newspaper reporters. Passengers on buses traveling from Ho Chi Minh City to the southern province of Dong Nai have fallen victim to several gangs who call themselves merchants of ‘panacea’, forcing people to pay heavily for their products. 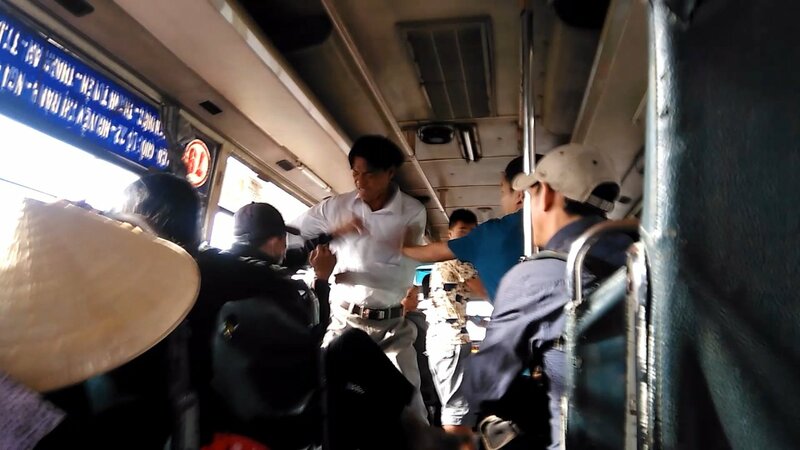 Within 30 kilometers of the Suoi Tien Bus Station, in District 9, Ho Chi Minh City, people aboard coaches have been easy targets for at least four groups of muggers. The thugs use several methods, from putting on a show to threatening and assaulting their victims in order to appropriate their property. The victims are mainly poor people from the countryside who come to the southern metropolis to earn a living or receive treatment for health conditions. According to Tuoi Tre (Youth) newspaper reporters’ observation on the morning of November 9, a gang of five men from 25 to 50 years old led by a man named Chanh gathered at the Suoi Tien bus stop at around 8:30 am. The outlaws dressed themselves in jeans, T-shirts or shirts, and shoes, and held several small pieces of paper advertising a medicine called PIROMAX, which they stored in their bum bags. After 10 minutes scouting the area, the men boarded bus No.12 toward a stop in Dong Nai and began preparing their daily endeavor. At around 10:00 am, another of the gang members pulled over a passenger bus, which was carrying some 30 people, before getting on the vehicle. One of the members started promoting their ‘panacea’ while the other four acted as passengers, whose role was to express enthusiasm for the products. The 'merchant' then began handing out his blister packs of PIROMAX ‘for free’ as the whole gang tried to shovel the medicine into the hands of the passengers. Some travelers managed to resist the ‘gifts’ while others with the pills in their hands then became the targets of the scavengers, who showed their true nature. “Collect the money!” Chanh shouted, before his accessories forced the unfortunate victims to pull out their money and took whatever they had. After snatching VND1 million (US$44.15) from 19-year-old Thien and another VND1.2 million ($52.9) from a 22-year-old passenger, the group quickly disembarked from the bus. After comprehending the situation, Thien went to follow the muggers only to be thwarted by the threat of another man, seemingly a member of the gang. “If you get off the bus, they will stab you to death. They are all drug addicts. Dare to follow them if you do not believe me,” the stranger asserted. According to the bus driver, many people have become their prey, powerless to resist. “I could only warn my passengers of the incident. They would attack us if we interfere with their operation,” the driver said. Using a similar scheme, Chanh’s men had earlier plundered VND200,000 ($8.83) from a 40-year-old woman on November 7 as well as threatening an undercover Tuoi Tre journalist when he tried to stand up for the victim. The gangs do not just verbally intimidate passengers but do not hesitate to throw fists at those daring to talk back. At 8:00 am on November 3, Cuong, an experienced merchant of ‘panacea’ and his disciples boarded a bus heading toward Ho Chi Minh City. They performed a similar play, with Cuong the seller and his followers disguised as passengers. The scheme was going smoothly until one male passenger in his 30s revealed the scam, threatening to call the police. Cuong then charged at the man before he could finish his sentence, grabbing his shirt. “I will beat you to death!” the thug shouted before punching the passenger repeatedly on his chest and head. “Go ahead and call the police. I can give you the number,” Cuong said before leaving the vehicle with his gang. On October 28, the groups of Chanh and a man named Son raided a shuttle bus in Bien Hoa City, Dong Nai, introducing themselves as medicine sellers of a charitable organization. One of their victims, 21-year-old Bui Tien Vu, was pressured to pay VND200,000 for two packs of pills. As Vu said he did not have enough money, he was attacked by four men, resulting in a bleeding mouth, scratched forehead, and broken glasses. The thugs spared no one, a witness said, recalling an elderly woman who had also been terrified by the criminals. Farmers in the Mekong Delta region of southern Vietnam are willing to add salt to their freshwater ponds in order to cultivate shrimp, a practice experts say can destroy the local ecosystem. Is homeschooling a rising trend in Vietnam?